After several easy recipes this week’s selection from Baking Chez Moi was a bit more challenging. This beautiful tart begins with a fully baked sweet tart crust. Next, a layer of lemon-almond cream is spread over the crust, then a grapefruit cr̕emeux is spread on top of that and then the grapefruit sections are placed on top of that layer. Even though I ended up making most of this in two days, it could easily be made in steps over three or more days. The lemon-almond cream can be refrigerated for up to three days and the Grapefruit cr̕emeux can be refrigerated for up to 2 days. The crust is a fully baked sweet tart crust which could also be completed a day or so in advance. The lemon-almond cream comes together nicely in a food processor and is then refrigerated for at least an hour before being spread over the tart and baked. Next up is the cr̕emeux. It requires sugar, grapefruit juice and egg yolks being continually whisked over medium heat until they reached 180 degrees (without making scrambled eggs). Then it needs to be refrigerated for at least six hours before being spread over the baked lemon-almond cream. The final step is to place the cut grapefruit sections on the top and then refrigerate the completed tart for another two hours. I did make one modification from the printed recipe, I left out the Campari. This tart was fun to make and delightful to eat. The grapefruit gives it a fresh light taste and I do love the sweet tart dough crust! This post participates in the Baking Chez Moi bake-along. To see the other participants results visit the Tuesdays with Dorie LYL (Leave your link) blog post. The recipes are not generally posted online. You will need to buy the book for the complete set of recipes. I am retired and live in Southern California with my husband, two black cats, Sadie and Samantha, and Thor the Standard Poodle mix. 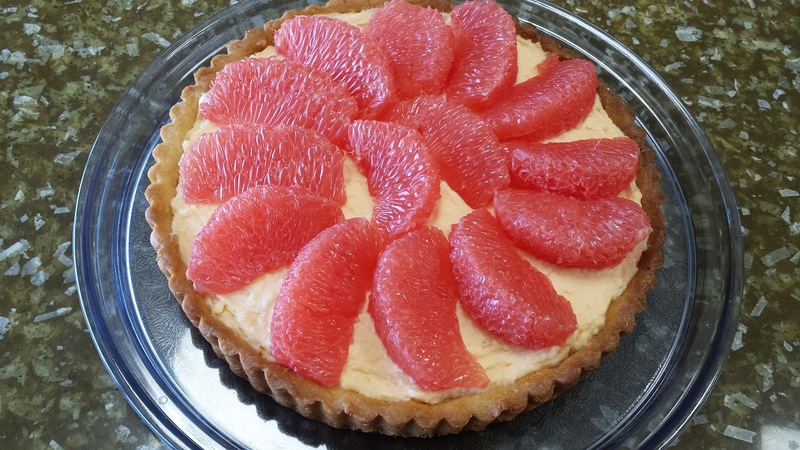 This entry was posted in Baking, Baking Chez Moi, Tarts, Tuesdays with Dorie. Bookmark the permalink. Thanks! I was lucky to have found some beautiful grapefruit. Your tart looks lovely. The grapefruit did make it quite refreshing. It was such a taste treat! Absolute perfection! You know, you are right, it was fun to make…just take each step at a time and in the end you have a fabulous dessert. Ours is gone (because I made a small version) and now I wish I had made the whole recipe, although I really don’t need to be eating a whole tart, it was really good! Yours is so pretty. I did take mine to work so that we wouldn’t eat it all. I had to stash away a piece to take home to my husband so he could try it too. looks beautiful–what a nice grapefruit you had! THAT’S A BEAUTY, SO VERY PERFECT. Thank you, it was fun to make. I thought it was great without it. Wow! Your tart looks delicious! The crust has a nice color to it, and the grapefruits look perfect! Great job! Tart looks great. It definitely took up a bit of time but I’m so tempted to make it again (figure it will be easier now that I know what I’m doing).